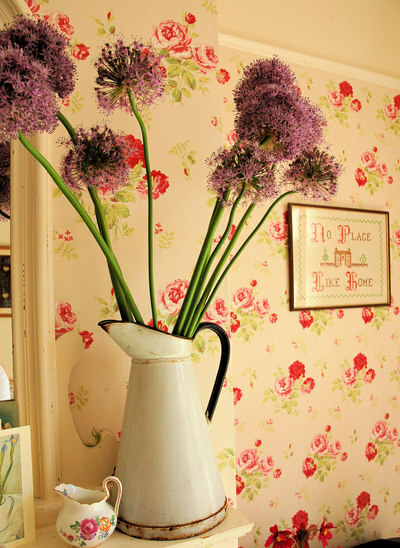 Have you ever seen one of these china flower pictures? No, nether have I! I found it on Saturday and thought if it's frame was painted it might look OK on our mantelpiece. 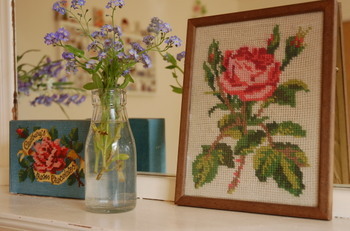 I also found this small cross-stitch of yellow roses (which will grace our wall of flowers) but didn't like the dark frame. So I got to work on both frames straight away. And here is the china flower picture. What do you think - does it look better with a white painted frame? I think it does but thought I would love it more. It may need moving around until it finds the right place. The other picture isn't quite dry yet so I haven't hung that. So my collection of china flowers is growing. I have found some more black bottomed ones. I am going to touch up where they have chipped with matching nail varnish. As I don't own yellow, purple, blue or green varnish I'm trying to summon up enough courage to go into the beauty department of a local store and use the tester nail varnishes on display. Can you imagine trying to explain myself if I get caught! Perhaps I should ask before I do it. Yes, I know it looks like a flower shop - or even a Maternity Ward, (actually the whole scene did remind me of the tears I shed in the Maternity Ward because I had too many flowers and didn't know what to do with them all. So I cried! My, those postpartum hormones made me crazy!) Anyway, there were no tears this time as I tried to sort out my fake flower fiesta. I have slowly become a fake flower convert, mainly due to the poor choice of fresh flowers in our local supermarket (I dislike 'posh' flowers prefering simple blooms that look like they come from the hedgerow or roadside) plus it was getting very expensive to buy them weekly which is how long they would last. Now let me show you my latest buy. Someone at school bought some fake blossoms in for our school play. I totally fell in love with them and rushed out the next day and bought some for myself. They are so realistic, the bark even has a very light spray of green on it to look like lichen. How clever is that? I'm going to use it for my Easter Tree and hang my painted eggs on it. Next are my Bluebells - love them too as they are so realistic; these have some china roses mixed in which aren't so realistic but I haven't found a better place for them yet. Remember this jug - the one of two I so carefully transported in my hand luggage from New Zealand. Yes, the ' be careful Anthony, I have a couple of big jugs' jugs . Oh happy days! a mixture of knitted and silk Anemones. And finally back to the dining room sideboard. There, I told you it was a fiesta didn't I? Now, I must prepare for a certain Goble girl's 14th Birthday today. Thank you for the wonderful response about my fake fiesta. Lots of you have been asking about the blossom and where I got it, and I so understand the 'I must have it or I'll stop breathing' feeling. Unfortunately, I don't think I can be of much help though. I bought it from a shop called Trago Mills (please visit the link as it isn't your usual sort of shop and their website can probably explain more than I can!) Trago's garden centre have a corner with loads of fake flowers and it was there that I found the blossom. I made the trip especially to get them and then discovered that they only had a few left. The label on each stem said 'Sincere Floral' and despite a google search have not come up with anything about the makers. Perhaps you will be more successful. They cost £2.49 per stem which is excellent value given the quality. I'm so sorry I can't find more and then pass it on to you but I will keep looking. If you are local I would suggest a trip to Trago as the range of 'fakes' they had were good BUT Trago gets BUSY and I mean BUSY. Hell on earth if I'm honest, so try to get there very early if you do go. I only visit once every 3 years! Hope to hear news that someone has tracked some down! I was about to tell you that all the flowers on my mantlepiece were fake but then realised that the fabulous 'drum-stick' primulas (in the middle) are real. 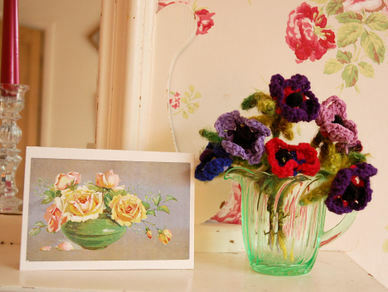 my new knitted flowers. Ooh, I feel a new project coming on..
Look at my bargain! I bought 9 Alliums for...£1..yeah...just a pound! I got 2 bunches at 50p each but I did have to barter. One was £1.99 and the other 50p so I begged, if truth be known, but managed to get them at the cheaper price. I have never had Alliums before though I do have some in an enamel bucket outside. 1. Paint old outside table and cover with oilcloth (Green Gate oilcloth no less!). 2. Potter around the garden and watch the Chelsea Flower Show and dream. 3. Sew at least one more cushion. 4. Read June edition of Country Living and drool. 5. Feed plants, deadhead and fix new hosepipe. 6. More sewing and listen to Radio Devon's Lunchtime phone-in or Anna Raeburn's LBC show. 8. Go to Dartington Hall and sit and ripple in their gardens. 10. Watch my washing blowing on the line. 11. Go to Lyme Regis fossil hunting. So I'm keeping my fingers crossed I'll be able to cross off at least 6 things... time will tell! Lilac Hyacinths. Scented...yummm! I always get to February and wish I had planted more bulbs last autumn so end up paying through the nose for them now instead. Why oh why didn't I pay £3.99 for 10 bulbs when I now pay at least £1 per bulb. Typical! 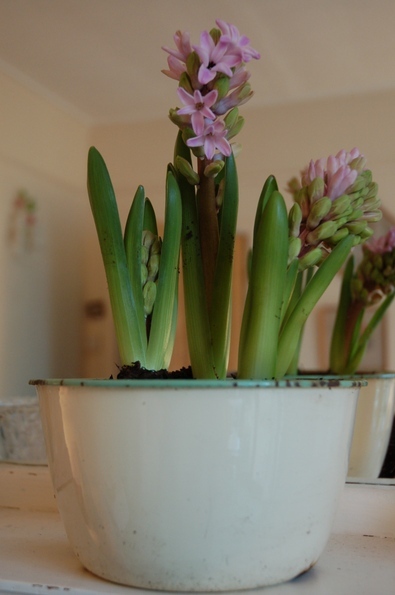 My favourites are the little pots of Grape Hyacinths which I hope I might be given for Valentine's Day (hint, hint!). Thank you once more for your lovely comments about my last post. My bag was from Louise Loves which is a lovely site & worth a visit. I did feel very uncomfortable taking the photographs so chose moments when no one was looking - hence the shop looked empty! But, I do have another job...sometimes I am a 'mystery shopper'! This means that I am paid to shop or make enquiries and then report back on how I was treated etc. It is quite interesting but I don't have much time to do this anymore. Shame it is mostly banks & building societies and not Green Gate, Cath Kidston ,Laura Ashley or any book shops isn't it? The tree may be down but I am still holding on. 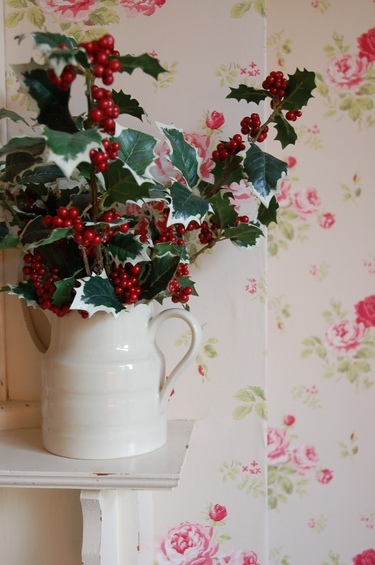 I can't bear to put my (ahem ..fake) cheery holly away so I ignore the 'Jane, you've forgotten to put the holly in the attic' comments. Well, I want to get my moneys worth..this fake holly was very expensive and holly isn't just used solely for Christmas. Is it!? Today is the first day that everyone is back at school (yee ha) and I have set it aside for some sewing. Well, that's if I get time as there is a mountain of washing, cleaning and thank you letters to do etc and my conscience is pricking. But hey, this quiet time wont last for long and there are always chores to do and besides I do have a lot of radio programmes to catch up on. Right, sewing it is. That is if I can find the table under the ironing! Gosh, I can't believe that I have not shown you the flowers on my mantlepiece for absolutely ages. 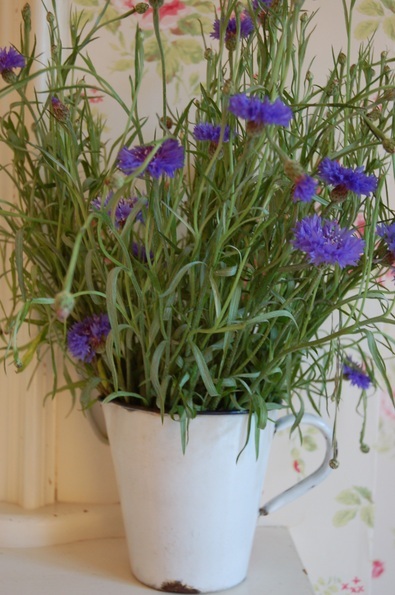 These Corn Flowers have spurred me on as what could look better? I bought them at Sainburys which usually have boring expensive flowers .. I just couldn't believe my Country Living eyes when I spied them..and the best part - they were only £1.99! As I keep telling Anth, I would be more thrilled with a simple 'country' posy than anything more expensive and flashy. What girl can resist simple, pretty flowers and if I'm very lucky..a love note in my sandwiches! Today I have a single pink ranuncula bought for only 50p. 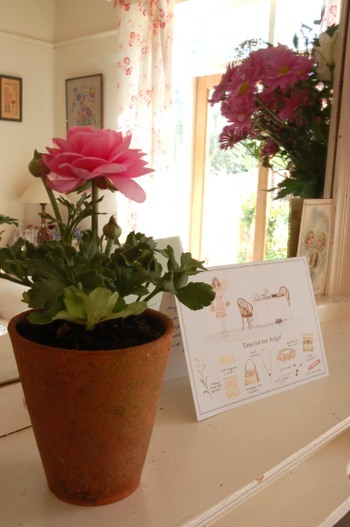 I then put it in an vintage terracotta pot. Pure, delicious simplicity! Ooh yes, and a lovely card from my mother. My last flowers didn't linger long so as I wasn't due a visit to town, my garden had to suffice. Mmm not much in flower apart from masses of Forget-me-nots. 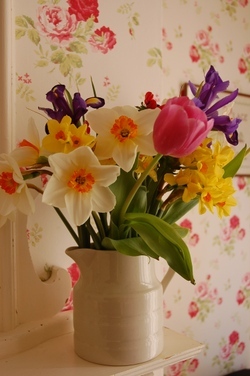 I bought the 1/3 of a pint milk bottle for £1 during our Easter visit to Ludlow -- just right for small hand picked blooms. I bet you wont believe me when I tell you that this photo was not staged -- I haven't put the 2 rose items together on purpose as they are just 2 of many other things on the mantlepiece. But I have to admit, once I loaded up the photo and it came apparent, it sure looks good! Every time I buy new flowers (I'm talking once a week) I have an overwhelming urge to photograph them and share it with you. 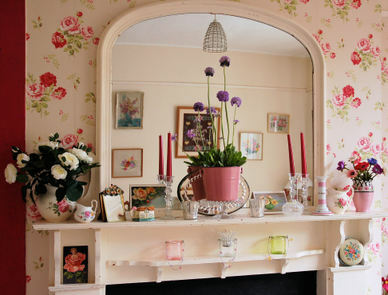 But, I thought to myself, who would really be that interested to know what flowers are on the mantlepiece in a 3 bedroom, end terraced house?